by Beth Reece. Originally published by the DLA at their website. 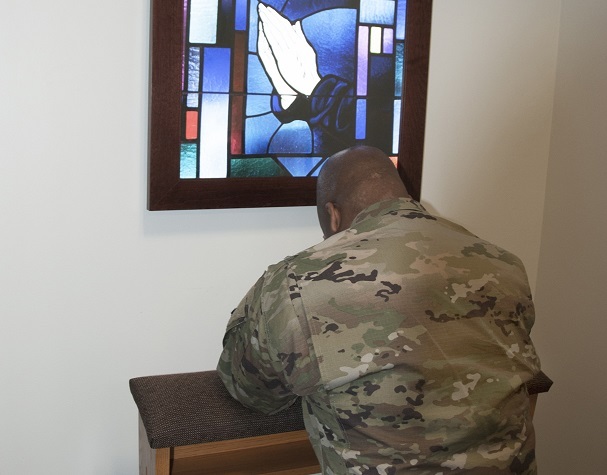 Fort Belvoir, Virginia — A quiet, serene spot for prayer and reflection is just steps away for McNamara Headquarters Complex employees. 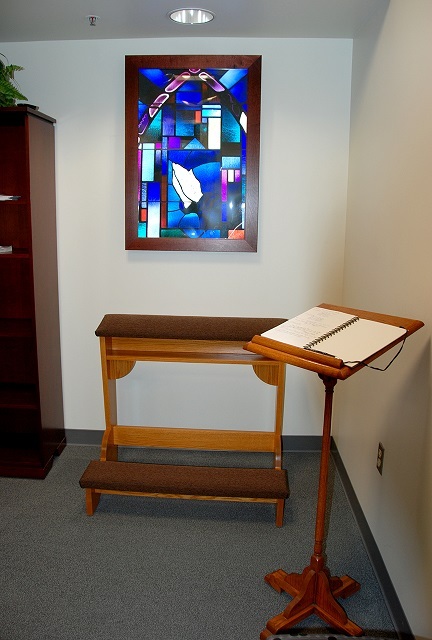 The former chapel in Room 1331 is now a newly renovated prayer and meditation room open 24/7 for employees of all faiths. A Feb. 16 ribbon-cutting ceremony will formally open the room to employees, but it is already available for use. A water fountain, scenic wall mural and guest book where employees can record prayer requests are among the updates. Other changes include all new ceiling tiles, recessed lighting, carpet, furniture and prayer rugs. 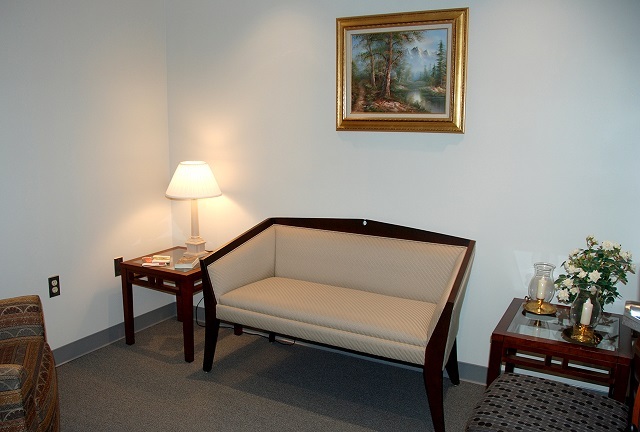 A private room is also available inside for pastoral counseling and reading. Perhaps the biggest highlight of the room is an LED light box that depicts a stained glass window from the Defense Distribution Susquehanna Chapel, which was built in 1941 and is one of the Defense Department’s oldest chapels. Birch said the room further demonstrates DLA’s commitment to resiliency, a goal that’s part of the “People and Culture” objectives in the agency’s strategic plan. The DLA resiliency model includes four pillars: mental, physical, social and spiritual. “DLA recognizes the value of people’s spirituality in their personal resiliency, and the fact that we can provide a place to practice that is a good thing for employees and DLA as a whole. People don’t stop having faith just because they come to work,” Birch said. He hopes the room will become a center where employees can also exhibit their faith by helping others. “We used to collect toiletries for homeless shelters in the area, for example. We’re trying to get that going again, and we’re also partnering with the Fisher House here on Fort Belvoir to see what we can do to help them,” Birch added. 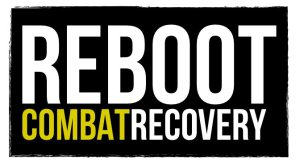 This article first appeared at the Defense Logistics Agency’s website, 15 February 2017. The photos, taken by Beth Reece, appeared with the article and are in the public domain. Posted on 22 February 2017, in Chapels, Chaplaincy and tagged Carleton Birch, Defense Logistics Agency, DLA, McNamara Headquarters Complex, Meditation Room, Prayer Room. Bookmark the permalink. Leave a comment.